Library administrators can configure custom actions to trigger a specific custom script on document classes. You can trigger either Update Action or Viewer Action custom scripts on a document class. Learn more: Create custom script. 1. Open the library administration interface and select Document classes. 2. Press a document class name to open the document class configuration. 3. Select the Customization tab to configure a new custom action. Note: You can configure multiple custom actions for one document class. Action name: This value can be retrieved in your custom script by calling the method _getDisplayName. Note: This name will be displayed in the custom action menu displayed to end-users if a Viewer Action is configured. 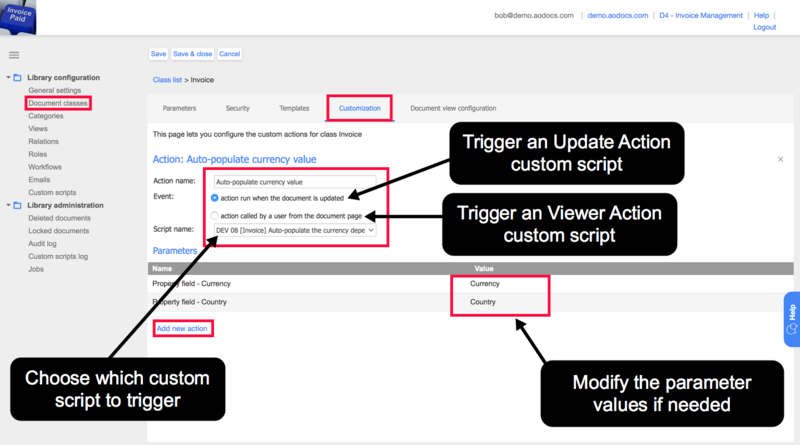 - If the event selected is action run when the document is updated, you can select Update Action custom scripts only. - If the event selected is action called by a user from the Document Viewer page, you can select Viewer Action custom scripts only. Tip: As a custom script can be triggered on several document classes, the custom script code can call specific parameters from the Parameters table. When configuring a custom script action, you can modify the second column Values of the Parameters table to adapt the custom script for the action you are configuring.